This is a wonderful Tudor silver-gilt hat badge, dating to the 16th century. The back of the badge is missing the 'S' shaped pin, used to secure the jewel to a hat. These were worn in place of livery badges, to show support or allegiance to a particular guild or employer. 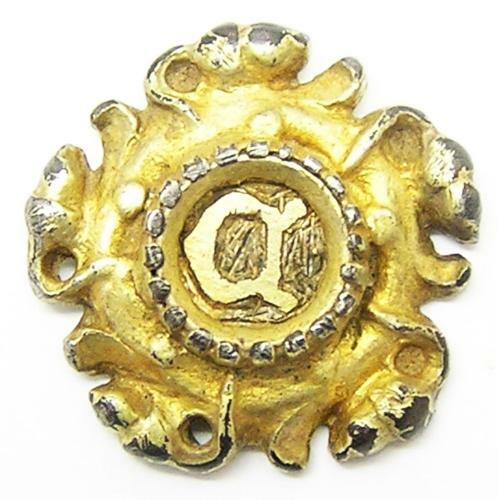 This example is very interesting, it displays a closed letter 'C' within a rosette, formed from budding acorns. It was found near Canterbury, the 'C' may stand for 'Canterbury' but I feel it represents a person, such as the Archbishop of Canterbury 'Thomas Cranmer', or even 'Thomas Cromwell'. A badge worn in the hat of a servant or clerk of one of these two men will be perfectly suited to such a badge. It is non-armorial, so more suited for a person who has no title to bear arms, which case Thomas Cromwell is my choice! This type of 'C' is used on silver coinage issued by Thomas Cranmer (see DENO-857440). DATE: c. 1520 - 1550 A.D.